I've known Kylies lovely Mum Caroline for a good few years and she kept me up to date with all Kylie and Ryans Wedding plans when we would pass in the corridor at work. 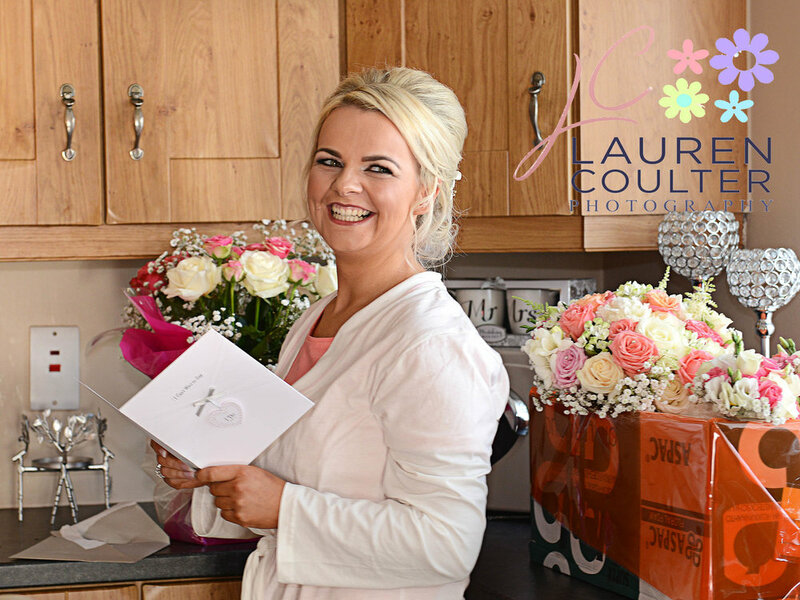 When she asked me to write a ‘wee blog’ as a surprise for Kylie I was delighted, and when I saw the amazing photos from Kylie and Ryans Wedding Day I was even more excited! With a stylish Mum like Caroline I knew that Kylies Wedding would be a stylish affair and in true form the Burke Ladies did not disappoint! Before we get into all the fashion goss let me tell you a little about how this lovely couple got together. Ryan spied Kylie at a friend’s BBQ and decided that she was the one for him. Six years later Ryan showed his romantic side and surprised Kylie with a beautiful diamond engagement ring hidden under the Christmas Tree! She of course said Yes and the date was set for the next August. When your Mum works in McElhinneys then you know you are going to have an amazing choice of Wedding dresses to choose from! With her girls by her side Kylie chose a stunning Mori Lee lace mermaid style gown with a detailed sweetheart neckline and a fabulous tulle train. Kylie fell in love with the dress as soon as she tried it on. To compliment her beautiful gown, she chose flowing chiffon dresses in raspberry from Creative Ideas Armagh while the mother of the Bride looked amazing in an outfit from McElhinneys. With the sun peeking through the rain clouds Kylies glam team arrived to transform the bridal party ahead of the ceremony. Silhouette Beauty Salon created a natural timeless makeup look with emphasis on the eyes and the elegant look carried through to the gorgeous up styles created by Sharon Kempston. 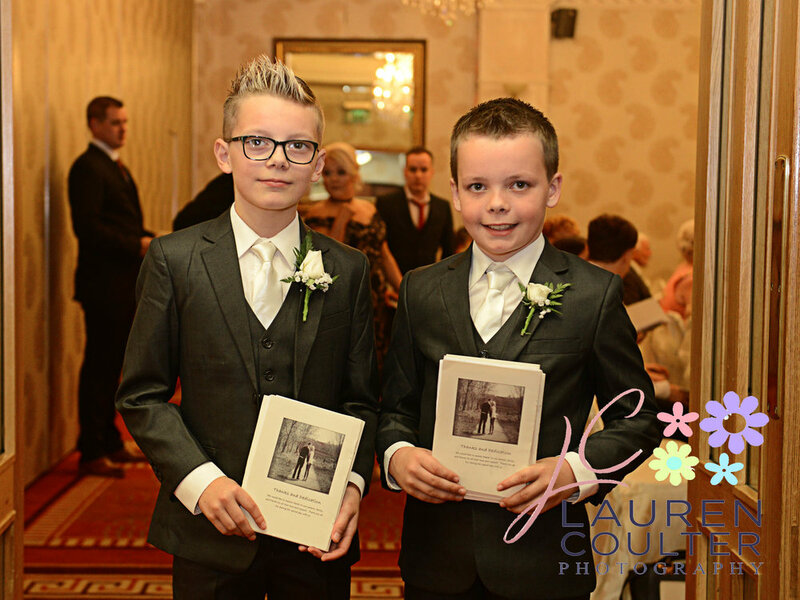 With nervous butterflies and slightly shaky hands Kylie and her girls slipped into their dresses and arrived at the fabulous Manor House Hotel in Enniskillen where a little rain shower didn’t dampen their smiles one bit! Ryan and Kylie enjoyed a gorgeous intimate ceremony at the Manor House and had their amazing photos taken in the grounds by the very talented Lauren Coulter Photography. Kylie was relaxed all through the day and her advice to any bride is ‘Don’t Panic!’. Friends and family enjoyed a day of laughter, bubbles and dancing into the early hours!